﻿ Is a skunk that is active during the daytime rabid? It is paramount to know key facts about skunks and rabies so that you are not fooled by myths that fly around. Is a skunk that is active during the daytime rabid? Rarely is this the case. The fact is that skunks can also be active during the day and not necessarily exhibit signs and symptoms of rabies. As a matter of fact, an active skunk during the daytime might be out foraging for food to fend for herself and probably her litter. These animals are nocturnal by nature, but this does not necessarily mean that they avoid light at all costs. As stated above, most skunks that appear during the day are mothers that are foraging for food. In most cases, they appear during the day and stay put in the den during the night. At a certain age, probably 5-6 weeks, the mother skunk will lead her litter out of the den to teach them hunting skills. In fact, during this particular time you’ll see most of these animals during the better part of the day. It is only after some time that they will develop typical sleeping and eating patterns. It is vital to take note that not all skunks are afraid of the light, both natural and artificial light. While some people might advise to use a flood light to keep skunks away, these animals might keep coming back because light attract skunks’ favorite food – bugs! Importantly, during the mating season both male and female skunks will tend to be out all day long until this particular period is over. 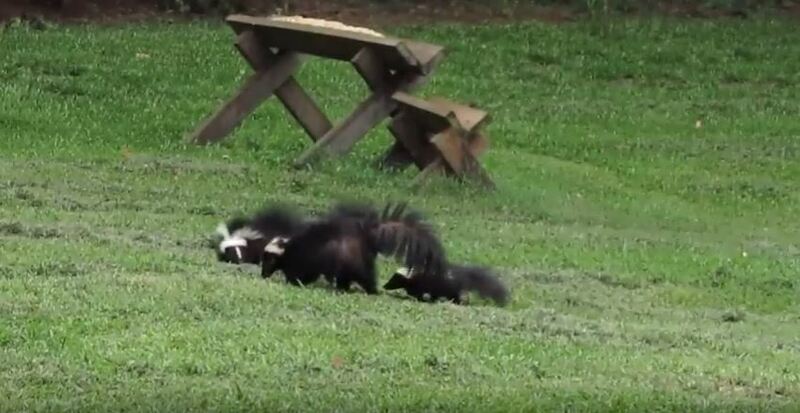 During this time,it is definitely wrong if you say that a skunk that is active during the day is rabid. In fact, in almost all cases this assumption is wrong. There are tell-tale signs that a skunk has been infected by rabies and poses a danger to you and your pets. These signs include but are not limited to: charging, biting, dormancy, dragging its tail, limp paralysis, and staggering. It all depends on the type of rabies that the skunk has been infected with. If you notice these signs and symptoms, you are advised to be quite careful and find the best way to get rid of the animal from your yard, house, garden, or anywhere that it is living in order to protect your family and your pets. Go back to the How to Get Rid of Skunks page or email us if you have any other questions about Is a skunk that is active during the daytime rabid?